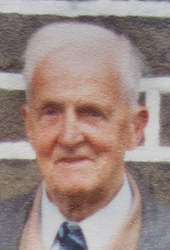 Will Marshall was born in Lord Street, Burnley in 1893. A member of the Burnley Lads Club, founded by Henry Davison Riley, he was employed as a cotton weaver at Parks Head when he enlisted in the Accrington Pals on 17th September 1914. "No, my pals went with me, three of us. They were Ben and Arthur - Ben Ingham and Arthur Brunskill. We were pals together in that, you see, we all went to the Burnley Lads Club and we decided to join. Well, a lot more joined from the Burnley Lads Club and Mr. Riley - he were made a Captain, he were - run the Burnley Lads Club and he joined up as well." The cold of north-east France in March 1916 came as a shock to the Pals after their 2-month spell in the desert heat of the Suez Canal zone. Marshall was one of several men to be hospitalized with frost bite. 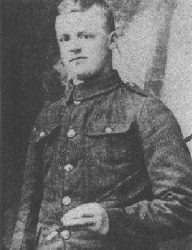 Shortly after returning some 3 weeks later, Marshall - by now a Lance Corporal - was one of a group of 6 N.C.O.s sent up to the lines for experience ahead of the main body of the battalion. Even before the trenches were reached, their nerves were cruelly tested as the deafening roar of British artillery opening fire just yards behind them threw them to the ground. The shock was enough to shatter the nerves of one of the Accrington sergeants. Once in the trenches, enemy artillery and sniper fire were constant threats. "Aye, there were snipers too, yes. You hadn't to put your head above, not in't daylight. You did do in't night, because there always had to be one sentry on at night to do two hours, come off and another go on for two hours. Then every night we'd to go out as a party and mend barbed wire at front of the trenches, and the Germans used to do the same, you see, and we were both out together. Well, when one went back, the others went back because we could hear them go back, we went back because then fireworks started." For the attack on Serre of 1st July 1916, Marshall was in one of two platoons of "Z" Company assigned to the fourth wave led by Capt. Riley. At 7.29am, the fourth wave left Monk Trench, 500yds behind the front line, and advanced slowly down the exposed valley slope facing Serre. Machine gun and artillery fire immediately tore into the closely-packed line of men. "They [German machine guns] were just sweeping across, men were falling at either side, all around you. By time I got... there were three of us of my section left, there were only three of us left and by time we'd got to where... we'd only gone about a hundred yards, must have done, to German front line and they'd gone back you know, they weren't there. And there were just them three of my section left. They were Calvert and another fella, I forget his name at present, and me. Well there weren't another man within 60 yards at either side of us, so you can tell how many had fell up to getting there and we'd only gone about a hundred yards. We'd got to like a big shell hole, where a shell had dropped before, previously, and Calvert and this other boy went round to left and I went round to right of this shell hole, we didn't go down it. Well another shell came and I were blown off my feet flat on to floor. Didn't know where I were for a minute and when I picked myself up, these two were missing. There were only me there. A bit of shrapnel had hit me in th'arm and another piece just across my leg. Well there weren't another soldier within sixty or seventy yards either side of me then." Without the use of one of his arms, there was nothing to be gained by attempting to go further forward. Marshall edged backwards, eventually reaching the relative safety of a trench, finding it already full of wounded men. "No, you couldn't get attention, there were too many you see. When I got back to my own lines, it were an impossibility to get any [help] at all and they said to us "get out if you can - there's another service just outside of the trenches - and get to that". Well when we got to that, just outside of the trenches, it were just as bad as that what were in the trenches like. It were just as bad, you couldn't get no service whatever, only inoculated you against lockjaw." Marshall had to walk for more than 3 miles before finding treatment for his wounds. Following some 9 months hospitalization in Liverpool, he was discharged wounded from the Army and found employment as a munitions inspector. Will Marshall was the last known surviving Pal, dying only in 1995, one month short of his 102nd birthday. Right: Will Marshall. Photograph by kind courtesy of Phil Brooks. All quotations and audio content appear by kind courtesy of the North West Sound Archive. They must not be reproduced or broadcast without prior permission of the NWSA (Clitheroe Museum, Clitheroe Castle, Clitheroe, Lancashire BB7 1BA).